Resources for insurance and legal professionals for creating insurance coverage charts and allocations, as well as insurance-specific IT support. Provides computer software and bureau statistical reporting to the property and casualty insurance industry. ASP provider of insurance services including policy and claims administration, workers compensation, and surety bonds. Developer of integrated software solutions for the employee benefits, pension, insurance, and financial services industries. Provides product information. Provides instant automobile insurance verification system to authorized subscribers. It is able to report the exact insurance status of every vehicle and driver. Available in the USA, Europe, Japan, and Australia. Specializes in insurance applications for farmowners, auto, homeowners, and specialty lines. Site describes their flagship product, Advanced Insurance System (AIS). Provides insurance claims software and risk management information systems (RMIS) for multiple lines of insurance including workers compensation, liability, and non-occupational disability. Offers customized solutions to insurance agents through the creation of comparative rating programs for auto, home, business owners, farm, and commercial insurance lines. Works with the information technology organizations of insurance and insurance-related companies to achieve enhanced IT infrastructure and applications. Offers comparative rating, agency management, and ACORD forms software. Also designs and hosts insurance agency websites. Developers of insurance automation software. Site describes products for underwriting, claims management, bill review, and portfolio risk management. Specializes in software and outsourcing solutions for the insurance industry. Provides software solutions for health insurance providers and agents. ASP providing certificate of insurance management and delivery. Website design and promotion for legal and insurance businesses and associations. Builds custom software for rating business owners insurance. Automation solutions for independent property and casualty insurance agencies and brokerages. Offers software solutions for the insurance, banking and finance industry. Provides electronic communications services to insurance and health care companies. Has several offices in the USA. Develops ERM/CRM and messaging solutions for the banking and insurance sectors. An end-to-end net-centric software platform for property and casualty insurance. By Steel Card, LLC. Provides e-commerce based system solutions to insurance and financial companies worldwide. Offers mobile solutions for business, consumer and insurance users of PalmPilots. A provider of anti-fraud insurance solutions which utilize expert systems technology. Products include WINS Digital and automobile liability insurance reporting. Supplier of automation tools to the insurance premium audit industry. Offers e-business solutions for insurance companies, adjusters and clients. If the business hours of VoodooHosting.com in may vary on holidays like Valentine’s Day, Washington’s Birthday, St. Patrick’s Day, Easter, Easter eve and Mother’s day. We display standard opening hours and price ranges in our profile site. We recommend to check out voodoohosting.com for further information. 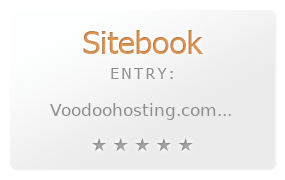 You can also search for Alternatives for voodoohosting.com on our Review Site Sitebook.org All trademarks are the property of their respective owners. If we should delete this entry, please send us a short E-Mail.